Movie critics are more influential than ever in Hollywood despite their dwindling readership and media outlets jettisoning some of them to save money. In the 1960s and '70s, prominent publications prized having brand name critics whose strong opinions could make a difference at the boxoffice. Among the best: Judith Crist (NY Herald Tribune, New York), Pauline Kael (The New Yorker), Andrew Sarris (Village Voice), Dwight Macdonald (Esquire), Hollis Alpert (Saturday Review) and TV hosts Roger Ebert (Chicago Sun-Times) & Gene Siskel (Chicago Tribune). Today's critics have power, too, but not individually. They've become an aggregated Rotten Tomatoes score that helps moviegoers decide if a film's worth paying to see. 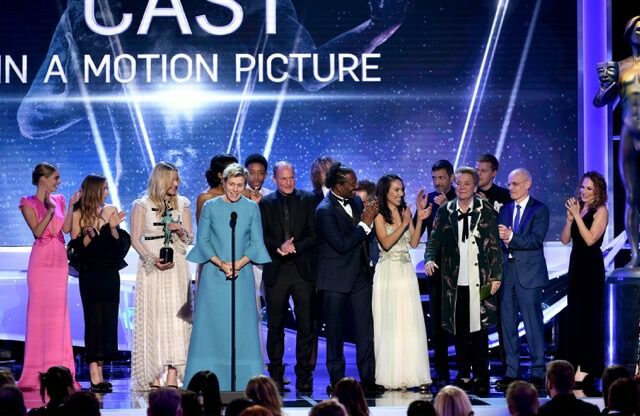 Critics basically determine awards season contenders (pictured – "THREE BILLBOARDS" cast at SAG Awards) through their critics groups votes prior to Academy members and others making their own nominations. It no longer really matters what critics think as long as we know if collectively it's thumbs up or down. As for awards, once the critics groups have voted, everybody else knows which handful of movies they need to consider. It's hard to look at the Oscar weekend boxoffice and not think about how "BLACK PANTHER," which just hit $501.1M domestically, is unlikely to be a 2019 best picture nominee. Even with its 97% RT score, Academy members aren't likely to give "BP" the time of day when they nominate next year's best picture contenders. It's the same cultural snobbery that kept "WONDER WOMAN" out of this year's race and that's put a damper on the Oscars since 1998 when "TITANIC" won 11 races, including best picture. An average of 57.3M people watched that telecast. This year's numbers won't come close to that because most people didn't see the contenders and couldn't care less who won. All told, it was a dismal boxoffice weekend with underperforming openings for "RED SPARROW" ($17M) and "DEATH WISH" ($13M). Ticket sales, per comScore's Paul Dergarabedian, were $150M, down 21.3% from $190.5M last year. 2018 is now up 10.9% over 2017, but a week ago it was up 12.7%. Help is on the way, however. 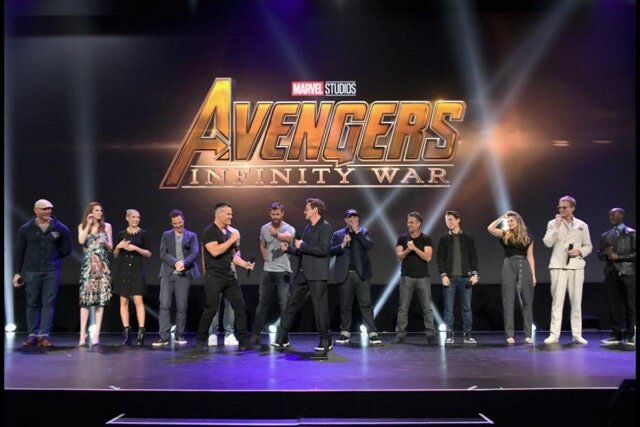 Disney/Marvel announced last week that "AVENGERS: INFINITY WAR" (pictured) will hit the multiplexes Apr. 27, one week earlier than its original May 4 release date.